Can a migraine feel like or mimic a stroke (symptoms and signs)? What triggers or causes migraines vs. strokes? What are the treatments for migraines vs. strokes? A migraine headache is a type of headache that causes severe, intense, and throbbing pain on one side of the head. A migraine “aura” describes visual, sensory, speech, motor, or other central nervous system symptoms that precede a migraine headache. A stroke or "brain attack" occurs when a blood vessel in the brain is blocked, leaks, or bursts, which deprives brain cells of oxygen and they begin to die. The part of the body controlled by the damaged area of the brain loses function. There are three types of strokes, transient ischemic attack (TIA, mini-stroke), ischemic, and hemorrhagic. The most common type of stroke is an ischemic stroke. A migraine aura may resemble a transient ischemic attack (TIA, mini-stroke), and a headache that seems similar to a migraine may occur during a stroke. A main difference between the symptoms of migraine and stroke is that stroke symptoms come on suddenly while migraine symptoms tend to come on gradually. Migraine headaches can last between 4 to 72 hours and can be incapacitating. In a very small population of people who suffer from migraines with specific symptoms, migraines may be related to a higher risk of stroke. The specific type of migraine associated with an increased risk of ischemic stroke is migraine with aura, a type of migraine that affects about one-quarter of all people with migraine headaches. The cause of migraine headaches is not completely understood, but it is believed to be due to abnormal increases in levels of substances naturally produced in the brain, which causes inflammation. This inflammation causes blood vessels in the brain to swell and press on nearby nerves resulting in migraine symptoms. There may also be a genetic link to migraine headaches. On a day-to-day basis, “triggers,” or factors that contribute to a migraine headache may cause migraines. There is no cure for migraine headaches, but they can be managed with medications, lifestyle changes, and alternative treatments. Blood thinners are the most common treatment for acute ischemic stroke. The “clot buster” drug used in emergency settings is called alteplase (Activase), also referred to as tPA (tissue plasminogen activator) must be administered within 3-4.5 hours (depending on the circumstance) of the onset of stroke symptoms for the best chance of recovery. Ischemic strokes also can be treated with intra-arterial blood thinners or clot retrieval devices. Hemorrhagic strokes may require surgical removal of the blood clot, aneurysm clipping, coil embolization, or surgical arteriovenous malformation (AVM) repair along with stopping ant blood thinners. Although many people describe all moderate to severe headaches as "migraine," there are specific criteria used to identify migraine, tension, and other less-common headache varieties. One of the differences between headache and migraine pain is that migraine pain has a throbbing quality, and even the slight physical exertion (like walking up a flight of stairs) may worsen their pain. A migraine is a group of neurological symptoms that typically include a severe throbbing headache, usually on one side of the head. Researchers and doctors do fully understand the causes of migraine headaches; however, most think that they may be caused by changes in the chemicals in the brain, which causes inflammation, or the condition may be genetic (inherited). Migraine aura symptoms last just a few minutes and should not leave any lasting effects. It is common for aura symptoms to occur only on one side of the body (unilaterally) or one side of the visual field. After migraine aura symptoms resolve, usually a migraine attack or headache will occur. A stroke or "brain attack" occurs when a blood vessel in the brain is blocked, leaks, or bursts. This deprives brain cells of oxygen and they begin to die. The part of the body controlled by the damaged area of the brain loses function. A small stroke may only cause minor problems or temporary weakness or memory loss. A larger stroke can cause permanent paralysis or loss of ability to speak or in some individuals, death. Hemorrhagic stroke happens when a blood vessel leaks or bursts and there is bleeding into the brain tissue. Ischemic stroke occurs when a blood vessel is blocked by a blood clot in the brain. A “mini-stroke” (transient ischemic attack, TIA) is a type of ischemic stroke in which there is only temporary blockage of a blood vessel in the brain. Mini-stroke symptoms and signs only last a few minutes; however, it is still a medical emergency and 911 should be called. It is possible for a headache that feels like a migraine to occur during a stroke. A migraine aura may resemble a transient ischemic attack (TIA), also called a “mini-stroke” (a temporary stroke that resolves symptoms quickly without residual or long-term disability). It also is possible for a migraine aura to resemble a transient ischemic attack (TIA). Migraine and stroke may occur at the same time, but a causal link has not been established. When an ischemic stroke occurs during a migraine attack, it is called a migrainous infarction. In a very small population of patients with specific symptoms, migraines may be related to a higher risk of stroke. Migraines may be a risk factor for stroke, in that strokes occur more frequently in people who have had migraines, but the strokes do not necessarily occur during migraine attacks. The specific type of migraine associated with an increased risk of ischemic stroke is migraine with aura, a type of migraine that affects about one-quarter of all migraine patients. Moreover, women who have migraine with aura are at a greater risk for stroke than women without migraine, or even men who experience migraine with aura. People with migraines at highest risk for stroke are those who also have traditional risk factors for stroke such as high blood pressure, diabetes, high cholesterol, smoking, and obesity. The cause of migraines is not completely understood, but it is believed to be due to abnormal increases in levels of substances naturally produced in the brain, which produce inflammation that causes blood vessels in the brain to swell and press on nearby nerves resulting in migraine symptoms. There may also be a genetic link to migraines. On a day-to-day basis, migraine triggers or factors (environmental, chemical and many others) contribute to a migraine attack, but are not triggers for stokes. 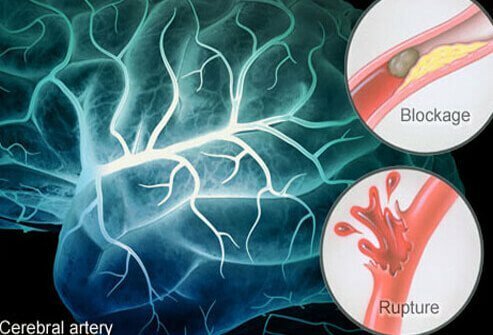 A blood vessel in the brain is blocked, leaks, or bursts causes a stroke. This deprives brain cells of oxygen and they begin to die. The part of the body controlled by the damaged area of the brain loses function. Medications to prevent an attack include antidepressants, anticonvulsants, beta-blockers, calcium channel blockers (CCBs), and hormone therapy (in women whose migraines are linked to their menstrual cycle). Lifestyle changes include avoiding known migraine triggers, maintaining a healthy balanced diet, regular exercise, limiting caffeine and alcohol, and stress reduction techniques. Biofeedback, acupuncture, and counseling may also help. Stroke is a medical emergency. If you have stroke symptoms, call 9-1-1 and get medical attention immediately. It is important to CT scan the patient’s brain to diagnose an ischemic stroke from a hemorrhagic stroke because the emergent treatments are very different. Blood thinners are the most common treatment for acute ischemic stroke. The “clot buster” drug used in emergency settings is called alteplase (Activase), also referred to as tPA (tissue plasminogen activator) and it must be administered within 3-4.5 hours of the onset of stroke symptoms (depending on the circumstance) for the best chance of recovery. Patients who cannot receive tPA may receive blood thinners such as aspirin and clopidogrel. Some stroke patients also may need, or benefit from, intra-arterial blood thinners or clot retrieval devices. Patients with carotid artery disease may get a carotid endarterectomy or carotid artery angioplasty to open blocked carotid arteries. Hemorrhagic strokes may be treated by taking patients off antiplatelet medicines and blood thinners to reduce bleeding. Patients with high blood pressure may receive antihypertensive drugs to lower blood pressure. Surgery such as aneurysm clipping, coil embolization, or arteriovenous malformation (AVM) repair may be needed to treat hemorrhagic stroke. Cutrer, MF, MD. Pathophysiology, clinical manifestations, and diagnosis of migraine in adults. UpToDate. Updated: Nov 13, 2017. Migraine Research Foundation. About Migraine. National Stroke Association. What is stroke? themigrainetrust. Stroke and Migraine. 2018. Tietjen, GE. MD. Migraine, Stroke, and Heart Disease. American Migraine Foundation. Updated: Jul 14, 2016. Womenshealth.gov. Migraine. Updated: June 12, 2017. Please share your experience with migraine or stroke. It may help others. What symptoms and signs do you have with migraine headaches? Do you have migraines with auras? What symptoms and signs did you or someone you know have with a stroke? What triggers your migraine headaches? What treatments are effective in managing your migraines? How was your stroke or that of someone you know treated? Foods also can trigger headaches. Histamine releasing foods (for example, preserved foods, canned meats and beans, alcohol, and shellfish) and tyramine-rich foods, for example, aged cheeses and meats, beer, red wine, and foods high in salt also can trigger headaches. Learn about 14 non-drug treatments for migraines. Acupuncture, biofeedback and massage therapy are among this list of non-drug migraine treatments that may help ease pain.